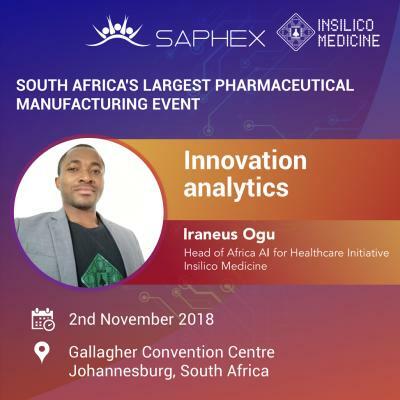 Wednesday, October 31, 2018, 2018, Rockville, MD – Insilico Medicine, a Rockville-based company developing the end-to-end drug discovery pipeline utilizing the next generation artificial intelligence is pleased to announce the keynote of Iraneus Ogu the director, Africa Artificial Intelligence and Blockchain for Healthcare Initiative at Insilico Medicine, Inc at SAPHEX 2018. Taking place 1st – 2nd November 2018 at the Gallagher Convention Centre in Midrand, South Africa, SAPHEX will be bringing together industry leaders, non-governmental organizations, key import and export authorities, local associations to facilitate business in Africa's pharmaceutical industry. "We are very happy to present our work at the at SAPHEX 2018, which brings together many African experts from pharmaceutical and healthcare industry. The topic of Artificial Intelligence for pharma R&D is rapidly gaining popularity and we are happy to be at the leading edge of research and one of the innovation drivers in this area", said Alex Zhavoronkov, PhD, the Founder and CEO of Insilico Medicine, Inc.
Keynote by Iraneus Ogu will address the theme innovation analytics. According to Iraneus, "the developments in the pharmaceutical sector have the potential to not only transform healthcare and help us address most tropical healthcare challenges but could help transform the whole economic landscape in Africa. Advances in tech such a machine learning could for instance help accelerate progress in drug discovery while also easing the resource constraints preventing many institutions and individuals in Africa from making original and transformative contributions to healthcare systems in Africa and beyond." "The knowledge we share and the projects we are working to establish around Africa would not only help advance healthcare developments and help people maintain health but would help transform every other aspect of the social and economic development of the people", said Iraneus Ogu.